This mod replaces the sim animations in Create-A-Sim. There are three versions available. Version 1 leaves most animations unchanged but replaces the animations for toddlers with standing ones. 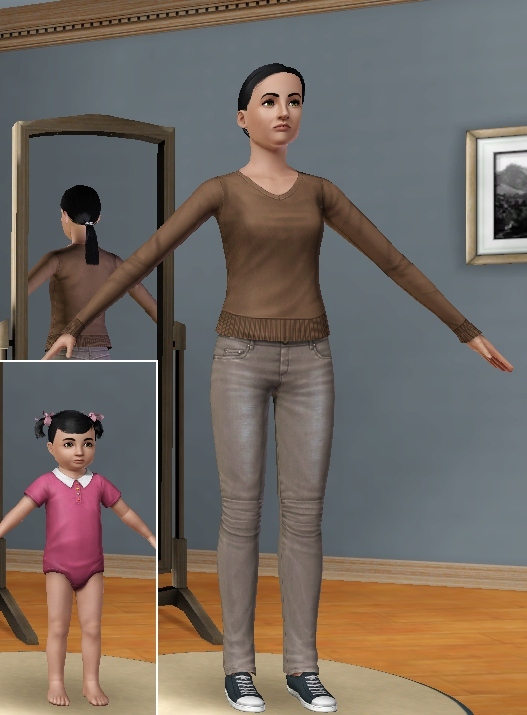 It is very similar to my old Toddlers can stand in CAS mod, but is build using the current game version and the camera has been fixed. Version 2 removes all the stupid idle animations and all additional animations which are for example played when changing clothes, changing weight or adding traits. It replaces all animations for all ages with a simple standing pose and a neutral facial expression. Sims will not greet you, sims will not smile, sims will not breathe, sims will not blink, sims will not move at all. Similar to Body Shop for TS2. Version 3 doesn't even use a basic standing pose. It displays all sims in their default pose ("bind pose") as you can see them in Milkshape and other modeling applications. Similar to Body Shop for TS2 after you hit F6. Incompatible with any other Mod that changes the CAS animations or the CAS camera. For example my old Toddlers can stand in CAS mod and Zoom-In CaS Camera by Shimrod101. If you use Awesomemod with this mod, please disable the NoSmilingInCAS option. If you use Version 2 or 3 they will not smile anyway, and it may cause toddlers to sit down randomly or sims playing the wrong animations. Compatible with 1.22 to 1.24, there is a beta version for 1.26 attached. It breaks the animation of animals in Create-A-Sim/Ceate-A-Pet so only use if you don't have Pets installed. It will conflict with other mods changing the same resources. TigerM for the Jazz editor, Peter Jones for S3PE. jonha_cas_animations_1.26_beta.zip | Description: For game version 1.26. Not compatible with the Pets expansion, will break the animations of animals in Create-A-Pet. Curtains! Stop Snapping to that Wall! !